A new image of Henry Cavill as Superman from the set of Man of Steel has arrived thanks to DCU Movie Page (via Latino Review). The image shows Cavill in costume posing with a young fan. I actually like what I see of the costume so far, and think that the final product after post-production will look great. 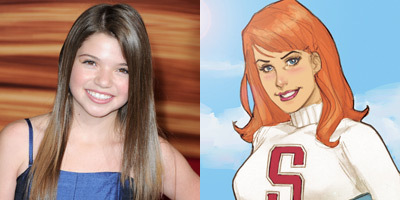 In other Man of Steel news, 13-year-old Jadin Gould (Chuck, The Mentalist, Battle Los Angels) will play a young Lana Lang in a flashback scene to Clark Kent's Smallville childhood, accordiing to Comingsoon and Superman Super Site. Lang first appeared in "1950's Superboy #50, Lana is the teenage girlfriend of young Clark. She was a central character in the television series, Smallville (played by Kristin Kreuk) and was seen as a teenager in 1978's Superman: The Movie (played by Diane Sherry) and later as an adult, re-entering Clark's life in Superman III (Played by Annette O'Toole, who would later play Martha Kent on Smallville)." Zack Snyder (300, Watchmen) is directing based on David S. Goyer's script. The film also stars Amy Adams, Russell Crowe, Michael Shannon, Kevin Costner, Diane Lane, Lawrence Fishburne, and Christpher Meloni. Are you excited to see Man of Steel when it arrives in theaters June 14, 2013? What do you think of this new image and this casting news? Henry Cavill compares MAN OF STEEL to DC's "New 52"